These table and chairs sets are the perfect addition to any household. Made from sturdy wood material with safety paint and vibrant coloursthey are sure to bring your child's imagination alive. Perfect for your children eating, playing games, painting, learning and etc. 【Environment Friendly Material】This table chair set is made of solid wooden material,without any odor, all corner rounded to give smooth surface to avoid any potential clothes or skin scratch. Wood and paints material are envrionment friendly.Safe and handcrafted with care.This is a suitable baby room table, toddler boy furniture&baby girl furniture, a must-have table cover for kid. 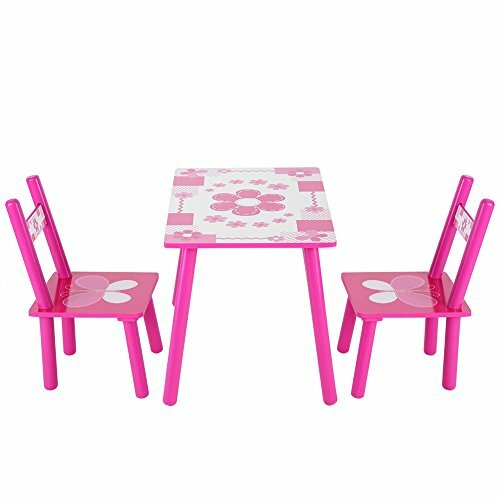 【Learning and Having Fun】This table set comes with 1 table and 2 chairs,pink color,top the table with a girl's favorite flowers and butterflies or use it for arts and crafts, tea parties, lunch and snacks, and so much more! It's also the perfect spot for drawing, painting, or other arts or a tea party at home or at classroom. It could be used as kid picnic table, kid dining table, book table, or play table. 【Standard Size For Kids】Furniture sized just for kids fits them better! 41.3 cm (16.3") table plus a 19.5 cm (7.7") chair offer comfortable sitting. It lefts certain space between table and seat of chair to allow kids to move freely and sit straightly. The chairs are designed to be tip slip-resistant and just the right height for kids ages 1 to 5 years old. 【Easy to Assemble and Sturdy】The sturdy hardwood table and chairs are easy to assemble,no tools needed, just need to easily spin on the four feet, the installation can be completed.This table & chairs set has a timeless natural finish and wipes clean to stay looking crisp and clean, it will last for years and can be passed on from one generation to the next. The natural, bright-colored look coordinates well with any room. 【Greative Gift】This set is a very thoughtful gift for girls from 1 year old to 5, accompanying them reading, painting and making friends.Kids will be thrilled when received such a unique birthday gift or Christmas gift.